A new bill could pave the way for small publications to cash in on legal notices. Westlake Junior High School needs a new roof. Salt Lake Community College is looking for someone to remodel its culinary arts kitchen. The county might rezone some commercial property. An oil-drilling corporation is looking to release a $51,000 bond for a waste disposal facility in Duchesne County. All of these notices—and an entire newspaper page filled with other interesting facts—was available on page D9 in the Friday, Jan. 29, edition of the Deseret News. These offerings, which sometimes cover multiple pages of the state's two large daily newspapers, are known as legal notices—a lucrative and state-mandated classified advertisement. For decades, these notices have been funneled to larger papers. But a proposed law could disperse these advertisements to smaller newspapers, such as this one. Rep. Scott Chew, R-Duchesne, has penned a bill, House Bill 178, which would strike much of the legalese from the state's present statute, freeing up smaller papers to compete for legal notices. Chew declined to name the publication that asked him for the law change, but said it was an advertising circular, the sort that might end up blanketing a neighborhood uninvited on a Saturday morning. As it stands, the law requires that any newspaper of "general circulation" can solicit and publish legal notices so long as it has at least 200 subscribers, has been published for no less than 18 months and is eligible for mailing under the U.S. Postal Service's "second class matter" stipulations. Under Chew's bill, the second-class matter stipulation—which no longer exists in Postal Service parlance—will fall, while the 200-subscriber and 18-month rules will stand. The hope, Chew says, is that by allowing advertising circulars to carry legal notices, more people who don't subscribe to daily newspapers will see whose homes are being sold at auction on the courthouse steps and when, where and at what time government entities will be meeting. "Not everybody gets a paper, but everybody, when they sit down at the coffee shop, they pick up the ads," says Chew, who is a rancher in Jensen, at the gateway of Dinosaur National Monument, and whose district includes the far-flung stretches of eastern Utah. He says his neighbors often note that they "wouldn't have know about so-and-so passing away if I hadn't seen the obituary in the nickel paper." Opposition to Chew's bill, though, could be mounting. On the morning of Jan. 27, shortly after Chew's bill became public, he said a representative from a media entity had just finished vocalizing his or her concerns with the bill. While the piles of cash at stake might seem like table scraps to a large media conglomerate, tens of thousands—if not hundreds of thousands of dollars—flow into the coffers each year of The Salt Lake Tribune and Deseret News, whose advertising business is run by an entity called Newspaper Agency Corp. (NAC), which, in modern times is also known as MediaOne. Because City Weekly isn't permitted to accept the advertisements, the City of Salt Lake does its legal advertising with NAC. In 2015, Salt Lake City Recorder Cindi Mansell placed 199 legal notices with the NAC. The advertisements cost an average of $154, bringing her department's total legal-notice expenses for the year to $30,641. Mansell says she typically spends $2,000 to $3,000 per week. In a general election year such as 2015, the number of advertisements climbs. For instance, in 2014, Mansell placed 168 notices at an average cost of $122.50, for a total of $20,580. Mansell can rattle off the array of meetings and special circumstances that, under the Open and Public Meetings Act, must be publicly noticed with an advertisement in a newspaper. "We do administrative hearings, auctions, auditor notices that budget documents have been completed, elections, land-sale notices; we put out [requests for proposals]," Mansell says. "We need to make sure the public knows our business." That readers under the age of 30 are still in the dark is not surprising. As the Tribune and Deseret News have steadily shed circulation over the past decade, conventional wisdom would hold that the number of readers privy to information contained in the tiny print of legal notices also has shrunk. City Weekly Publisher John Saltas says the main inhibitor to his access to legal notices over the years was the second-class matter provision. The details are now fuzzy, but decades ago, Saltas says he sought out this classification, but found it near impossible to obtain. Now, Saltas says he sees some irony in a law that, from his perch, appears to have been written by a conservative Legislature known to bemoan the reporting found on the pages of the Trib, all the while funneling cash into the newspaper's pockets in the form of legal notices. What Saltas says he's always wanted, and hopes Chew's bill will afford, is a chance to publish legal notices that, to-date, have eluded him. "That horrible left-wing media is being funded by the right-wing Legislature that hates them. That's a very strange relationship, and we're caught in the middle," Saltas says. "All we've ever wanted is the opportunity. It's only fair that we get the same opportunity, and why shouldn't we?" Bryan Scott is the publisher of the City Journals, which print and mail 250,000 copies of 13 different small newspapers between Ogden and Draper each month. Scott says he's looked into a getting a second-class matter permit but was told by the post office that no such thing existed. Like Saltas, Scott says it's clear the law needs to be cleaned up, and he hopes the final version will allow him to compete for legal-notice advertisements. "All in all, we're glad to see that all newspapers will be on an even playing field now with a law that doesn't seem to be written for a couple," Scott says. Also evident in this day where more and more souls walking the streets of Salt Lake City bow their heads to glowing screens rather than bury their noses in inky paper is a question of how best to reach the citizenry with important public information. Saltas points out that City Weekly prints 50,000 papers per week, all of which are distributed along the Wasatch Front, while the Deseret News prints roughly 40,000 copies per day and distributes those copies from Tremonton to St. George. 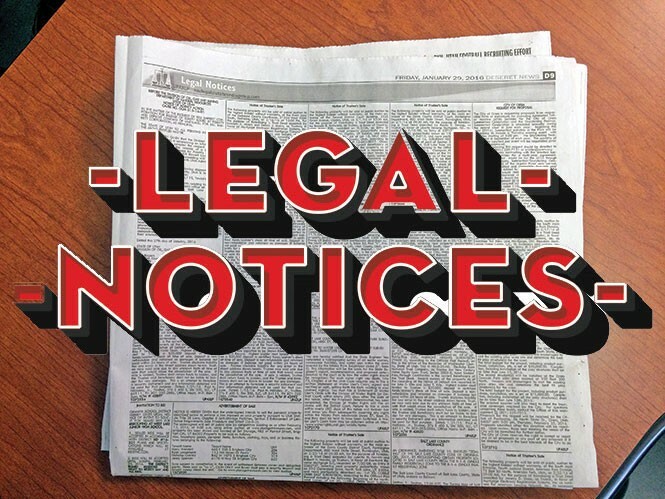 In other states, legal notice advertising has been made available to news outlets, including weekly newspapers. The Santa Barbara Independent carries scores of legal advertisements each week, mostly "doing business as" ads for new businesses. Brandi Rivera, the Independent's chief financial officer, says the paper has been permitted to carry legal notices since 1987 and that, as the daily paper in that town, the Santa Barbara News-Press, for which this reporter once briefly worked, saw its circulation numbers decline amid an ethics scandal, the Independent became a repository for ever-more legal notices. "In our market, we are the most circulated paper so it is definitely a disservice to the general public to not publish in the Independent," Rivera says, noting that legal notices make up about 25 percent of the paper's classified advertising revenue—a stream of money that all but disappeared in many of the nation's newspapers with the advent of Craigslist and other free online advertising forums. Saltas says City Weekly long resigned itself to succeeding without being able to publish legal notices. The possible revenue from the advertisements, he says, was never as important as the fact that his paper was forbidden to try. Setting money aside, though, Saltas says, municipalities should also be asking themselves whether their legal notices in daily newspapers are reaching the state's growing population. "You're merely going through the process of spending money and not caring if you truly are fulfilling the ambitions of informing the public," he says.